Indian alcohol makers are definitely upping their game and creating some great artisanal drinks, be it feni, gin or beer. 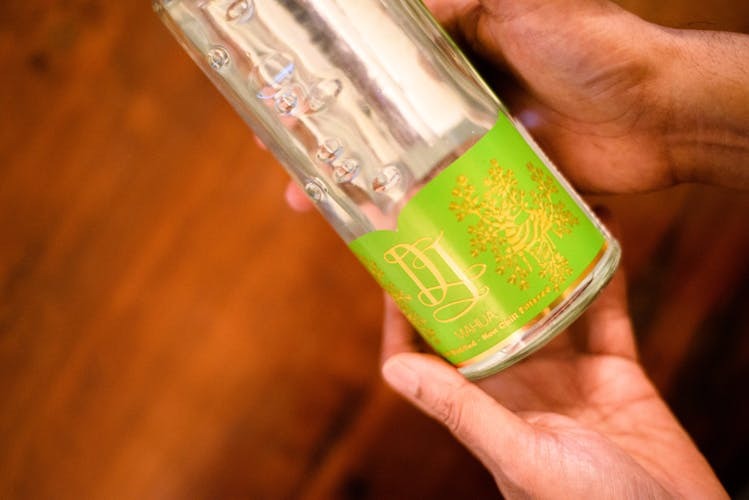 DesmondJi, the popular agave spirit brand giving a run to all other imported tequila brands in the country, is now making a totally indigenous spirit, working with tribals who have made it their own way for centuries. This time, they have taken the tribal spirit made from the mahua flowers in Central India, reinvented the process, brought it to Goa and taking it to the rest of the country and hopefully the world, under the name DJ’s. If you have never had mahua liquor before, you are definitely in for a treat with DJ’s Mahua Spirit & the Mahua Liqueur. Made using hygienically picked mahua flowers, that are handled, fermented and distilled with great care, these promise to be a fantastic addition to popular foreign spirits. So if you are all about trying new spirits and creating new cocktails, then this is definitely what you should go looking for. A totally indigenous Indian spirit being made for centuries, and now made keeping in mind global quality standards, it definitely makes us proud and is a great product to showcase to the world. The minute we took a sniff after pouring DJ’s Mahua spirit into the glass, the first thing that hit us was the beautiful floral scents of the flower. The spirit already has its first signature cocktail, co-invented 5 years ago by Dr. V from Chennai (he is 90 now), and the creator of DJ’s Mahua products, Desmond Nazareth, as they were sitting and having fun with experimental mahua spirit. So try it neat or make the Dr.V cocktail using tonic water, a drop of lime & the Mahua spirit. At INR 975 for a 750 ml bottle and INR 110 for a 90ml miniature, it is going to definitely give other brands a run for their money. If liqueurs are what get you excited, like us, then DJ’s Mahua liqueur, with notes of cinnamon, cloves, aniseed, combined with honey and other spices, is what you should have, just on the rocks, or if you prefer, in a cocktail. At INR 1,275 for a 750 ml bottle, or INR 150 for a 90 ml miniature, we think these will make for a great party pack. And at 40% alcohol strength, both products pack quite a punch. Skip your regular whiskey and rum, and go all desi this time with DJ’s Mahua or Mahua Liqueur. Recently launched and available only in Goa (as of now), it has already made its way to far off cities like Chennai & Delhi, courtesy passionate fans. Plus, if you are hosting a party of 20-40 people in Goa in the monsoons, they may just bring both of these to serve complimentary to your guests, and even make cocktails with them, of course with a few conditions and limited ones only. So check their Facebook page for more details on this offer.